Quantum computing offers the hope of solving problems that are beyond the capability of conventional computers by exploiting the enormous parallelism latent at the quantum level. By encoding information onto the quantum states of nuclei, nuclear magnetic resonance (NMR) can provide a testbed in which to experiment with physical implementations of quantum computing. This talk will present the basic physical principles underlying NMR and explain how NMR could be used to realize a physical quantum computer. The potential as well as limitations of NMR-based techniques for quantum computing will also be discussed. KAREN L. SAUER received the B.A. (Bachelor of Arts) in Physics in 1992 from Cornell University in Ithaca, New York. She pursued graduate studies in Physics at Princeton University in New Jersey, where she received the Ph.D. degree in 1998 for work on laser-polarized liquid xenon in the Atomic Physics group. 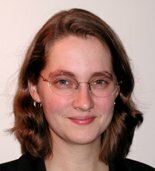 She was a Chateaubriand Postdoctoral Fellow at École Normale Supérieure in Paris, France from 1998–2000 working on dipolar field effects in highly magnetized fluids with the Quantum Fluids group at Laboratoire Kastler-Brossel. From 2000–2002 she was an NRC Postdoctoral Fellow at the Naval Research Laboratory in Washington D.C., working on three-frequency nuclear quadrupole resonance. In September 2002 she joined the Dept. of Physics and Astronomy at George Mason University where she is currently an Assistant Professor. She received an NSF ADVANCE award in 2002. Her main research interests lie in experimental atomic and molecular physics, with an emphasis on magnetic resonance phenomena. President Robert Hershey called the 2,191st meeting of the Philosophical Society of Washington to order in the Powell Auditorium of the Cosmos Club at 7:20 pm April 8, 2005. The minutes of the 2,190th meeting were read by William Saalbach, acting recording secretary, and approved. This was the occasion of the David Franklin Bleil Memorial Lecture in Physics, sponsored by David Frederick Bleil. Why study quantum computing? Ms. Sauer reminded us of Moore's law, which states that the number of transistors on a chip doubles every 18 months. The inside story says that chip development is not the controlling factor; it is that 18 months must pass before introducing a new product which will infuriate the existing customers. No matter which is closer to the truth, current computer architecture does limit the effectiveness of computing. There would seem to be two major advantages of a quantum computer, large searches and factoring large numbers. Using quantum computing, the effort of finding a needle in a haystack of N elements increases with the square root of N instead of N. Finding a certain word for a crossword puzzle that would take a conventional computer 500,000 steps would take a quantum computer 1000 steps. Factoring would also be much faster. Using Shor's factoring algorithm, factoring would be exponentially faster than the best known classical algorithm. This would seem to have major implications for cryptosystems. The building block of quantum computing is called the qubit instead of a bit. A bit can represent any intersection of two lines; a qubit can represent any point of a solid. It can be a combination of a 1-state and a 0-state, or a number of them. N qubits can stand for 2N power at once. A mere 50 qubits can represent every binary number from zero to more than a trillion, simultaneously. The readout, however, would be very long. Qubits are also unique by their entangled state. In classical computing architecture, two bits can be 00, 01, 10, or 11. The value of one bit does not affect another. In quantum computing, it does, because of the way the states of quantum factors affect others. She reviewed the experimentation to date. Nuclear magnetic resonance computation has been accomplished with seven cubits. An ion-trap system has been developed to control and read three qubits. Using superconducting electronics, computation has been accomplished with two qubits. A quantum dot system, using the spin of the electrons, has been used in computing with one cubit. Almost any interaction with the environment collapses the quantum state into a very definite state, or decoherence, and calculation stops. Therefore, the computer must be isolated from the environment, which makes it difficult to control and read the quantum states. A magnetic nucleus in a magnetic field behaves like a gyroscope and precesses about the field. The magnetic moment precesses in proportion to the field, and this has led to great concern and competition in the size of the superconducting magnets used. They are now working with magnets of 11.7 tesla. Fundamentally, the way an NMR computer works is this: A magnetic field is used to align the magnetic moments. Radio-frequency pulses at the Larmor frequency tip the magnetic moments out of balance. The transverse then rotates at the Larmor frequency and is detected by a coil using Faraday's law. The coil is part of a “tuned” circuit that is sensitive to a limited band of frequencies. The ability of the pulses to reverse spins has given NMR computing the boost to seven qubits. Isolating the computers is done by dissolving the molecules in a liquid. The effect of the magnetic field of one nucleus on another is largely averaged away in a liquid. It is best done on single molecule, but NMR needs 108 molecules to see the signal. The solution is to use a large number of molecules and read out a collective answer. NMR is too weak to determine the outcome and cause the state's collapse into specific states for each molecule. However, it is often good enough to see an NMR signal that represents the average over all the molecules. The equilibrium states of the molecules' nuclear spins are nearly random, with only a relative few pointing in the right direction. The solution is to use temporal, spatial, or logical labeling methods to single out the small fraction that do represent the desired initial state. These methods produce “psuedo-pure” states, where the readout shows what is designed even though most of the mix does not. Ms. Sauer predicts that the field will turn to a solid instead of a liquid form for the chemicals. Liquid state NMR computers will likely be limited to about 10 to 20 qubits; 50 to 300 are needed. She believes quantum computing has enormous potential, particularly for large-scale searches and factorization of large numbers. She recognizes that actual quantum computing is far behind current theory, but she says NMR has provided a good test bed for quantum computing, with its precise control of magnetic moments. Other quantum computers with better scalability should benefit from the ideas, concepts and solutions that NMR experiments have yielded. Ms. Sauer offered to answer questions. One questioner observed that the systems she described do not seem fast. They won't do traditional calculations well, she said, but that's not a fair comparison. They will do different calculations. “How do you input a number?” someone asked. We do not know how to put a number in a molecule. In solids, this may not be the problem it seems to be now. “Why can't the same problems be put on a classical computer?” another asked. Because a quantum mechanical state can mean a numericity of states. Ms. Sauer admitted there is no advantage to quantum computing currently. There is no problem the current machinery can't do better. It is the potential that is great. Mr. Hershey encouraged visitors to join the Society. He announced the next meeting and made the parking announcement. He invited everyone to stay for the social hour. Finally, he adjourned the 2,191st meeting at 9:50 pm.